Davenport Resources (ASX:DAV) is wasting no time as it progresses towards building Europe’s largest potash inventory in Germany’s South Harz region. DAV’s mining licences sit in central Germany’s globally significant South Harz basin, a region with an expansive history of potash production spanning 120 years. Some 182 million tonnes of potash has been extracted here since the 1890s, and forward-focused DAV is in a prime position to revive the region’s glory days. DAV finalised the acquisition of three perpetual mining licences in April from the German government, which contain historic high-grade Resources in ‘next to be mined’ parts of the potash basin. These Resources support a long-life project of what could be more than 50 years. DAV’s underlying strategy is to fast-track the conversion of its historic potash Resources to JORC (2012) standard and continue firming up its Resource base — and it’s off to a very good start. DAV recently unveiled, and then quickly upgraded, a maiden JORC Resource of 576.6 million tonnes at 12.1% potassium oxide (K2O), or “potash”, for the South Harz Potash Project’s Ebeleben licence. The Ebeleben area was explored during the 1960s and 1980s under former German Democratic Republic (GDR) state control, and was at one stage to be developed as an extension of the adjoining Volkenroda mine, which yielded 27.4 million tonnes of potash. DAV’s Mühlhausen, Keula and Nohra-Elende historic Resource, on the other hand, sits at an impressive 1.11 billion tonnes containing 114.9 Mt K2O, making for a very solid foundation from which to fast-track exploration to a JORC-compliant Resource, as already demonstrated by DAV’s successful Ebeleben Resource conversion back in April. DAV is expecting to have an Inferred JORC Resource for its Mühlhausen exploration target — three areas with a combined target of 286 to 510Mt K2O by June, that’s just next month. 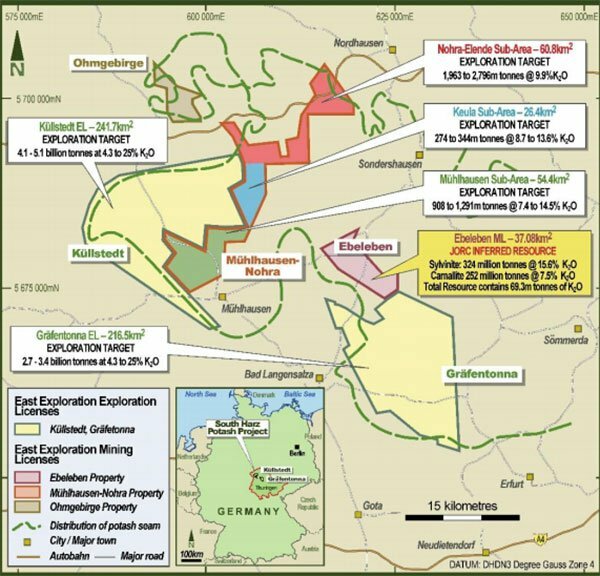 On top of this promising cluster of historic and newly confirmed JORC-compliant Resources, DAV has exploration licenses for the Küllstedt and Gräfentonna areas and is currently looking at confirmation of Resources therein. A considerable advantage here is DAV’s veritable treasure trove of high-quality historic data. There’s a total of 114 drill holes within DAV’s mining licences — 89 of these are exclusively for potash. Today, this translates into at least €100 million (~A$158.3M) worth of potash exploration data, including evaluation, geochemical and mineralogical information. Before we go too far, it should be noted that this is a speculative stock and investors should seek professional financial advice if considering this stock for their portfolio. In short, with an experienced management team and key staff based in Europe, this fast-moving ASX explorer seems to have all the right ingredients for a high-impact potash play — and in a covetable location to boot. It’s not just the South Harz region’s expansive potash mining history that bestows this location with major credibility points, either. It’s also a low-risk jurisdiction with low infrastructure requirements and close proximity to European markets (Europe remains a net potash importer). DAV’s plan to develop its historic potash licences is especially strategic given the critical role potash plays in feeding the world’s growing population — that’s set to surge to 9.3 billion by 2050. 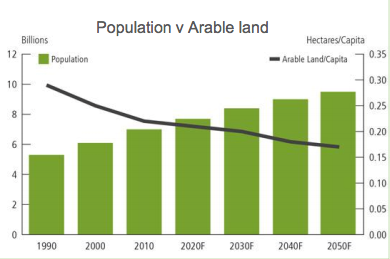 This growth, alongside an increasing shortage of arable land, means that fertilisers are required in increasing amounts to improve crop yields. With that in mind, it could well be that DAV, which is currently capped at a tiny $2.9 million and only just getting started, could be in the right place, at the right time. 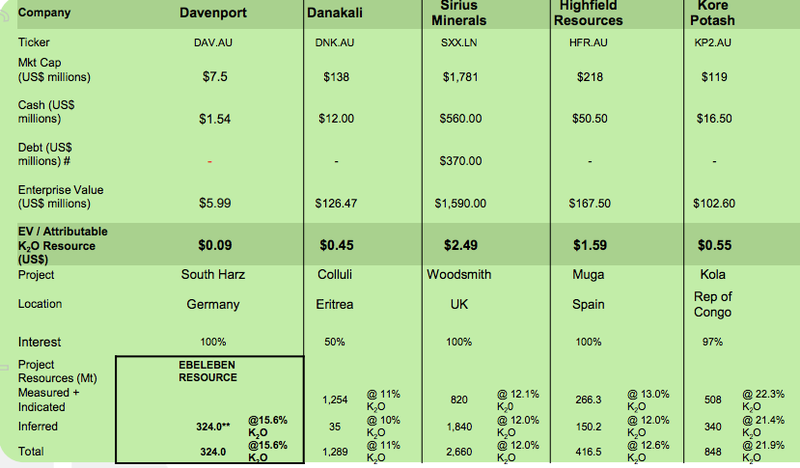 We last caught up with Davenport Resources (ASX:DAV) in April with the article, DAV’s Maiden JORC Resource - A Stepping Stone to Largest European Potash Holding — a title which speaks for itself. In that piece, we looked at DAV’s three licences and associated high-quality data, as well as the maiden Resource in question. 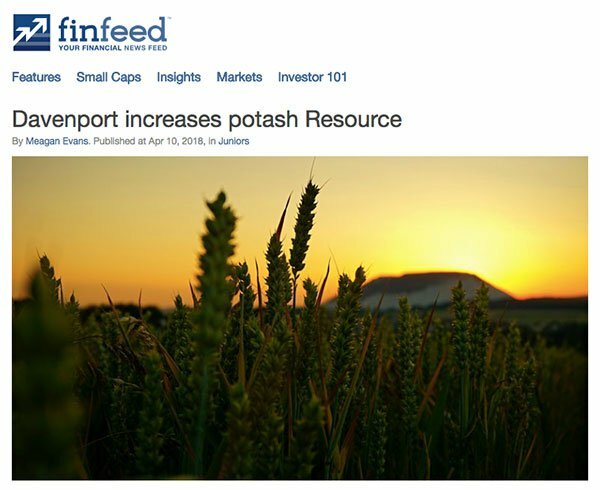 We also took a look at the growing potash market, which could be the slow-burn success story of the commodity markets that could be set for a break out this year. Since then, DAV has updated its maiden JORC Resource at Ebeleben, significantly increased the known historic Resource base at the Mühlhausen-Nohra licence, and completed the acquisition of the three perpetual mining licences. That’s pretty expedient work in a mere month, suggesting to us that DAV isn’t the kind of company that likes to mess around. Also boding well for DAV is its world-class team. DAV’s directors and management have experience in potash and other minerals throughout Western Europe, Australia, the Middle East and Africa, with skills in finance, geology, project development and operations. Its key staff are based in Europe, so this is a region that it’s very well-versed in. In addition to its German potash main assets, which remain DAV’s central focus, the company has a promising copper/gold play in the Northern Territory: the Southern Cross Bore Project, which we looked at in our last article. DAV recently announced its maiden Resource for the Project’s Johnnies Reward prospect. Today’s article focuses on DAV’s main play, its potash prospects. But this side-order of copper and gold gives its exploration portfolio a pleasing level of diversification. 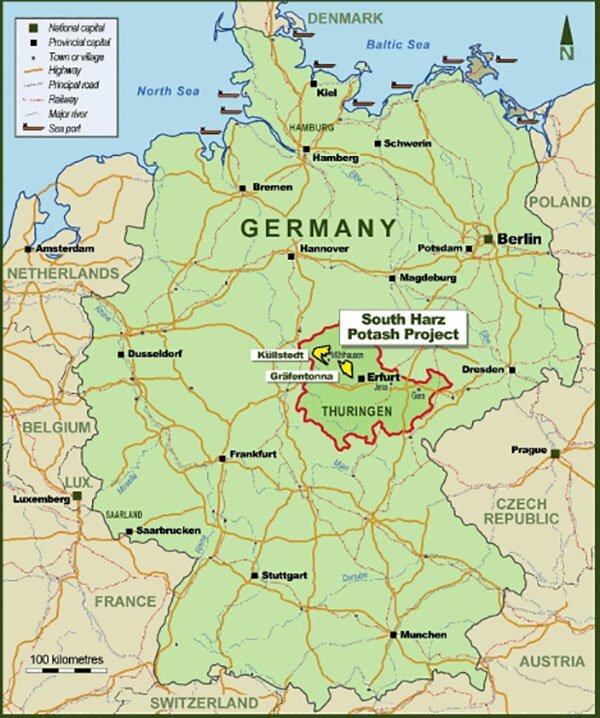 The South Harz potash district sits in the northern part of the German Federal State of Thuringia, within central Germany, and has a history of producing potash from both sylvinite and carnallitite ores. It’s been mined by both conventional underground and solution mining operations. Prior to the re-unification of Germany, the former GDR produced around 3.3 million tonnes of potash per year. This region has been a veritable hub of potash mining, from which a total of some 181.7 million tonnes of potash has been extracted since the turn of the century. It’s worth highlighting here that all three of DAV’s licences are perpetual mining licences granted under the former GDR system. Importantly, this means they are not subject to expiry, rent, royalties or reporting requirements of the current German tenure system (they are still subject to the usual environmental laws and mine development regulations. Notably, South Harz is a low-risk jurisdiction, with minimal infrastructure requirements — power, water, gas and rail are already in place. Encouragingly, the regional government is also supportive of job creation projects. However, DAV still needs to do a great deal of work to do here, so investors should maintain a cautious approach to any investment decision made with regard to this stock. DAV’s Ebeleben JORC Inferred Resource of 576 million tonnes at 12.1% K2O (110.1 Mt of KCl) extends from the now-closed Volkenroda mine to DAV’s Gräfentonna licence. The Volkenroda mine closed in 1991 after 80 years of operation. The total mining licence area is 37 square kilometres with 31 drill holes. Historic mining here lays a solid foundation for future work, with advanced planning in place for mine development. Shaft sinking had begun but did not proceed after German re-unification. Encouragingly, the Ebeleben Resource contains thick sylvinite, with grades similar to typical international operations, so DAV will likely be using tried and tested methods to develop this Resource. 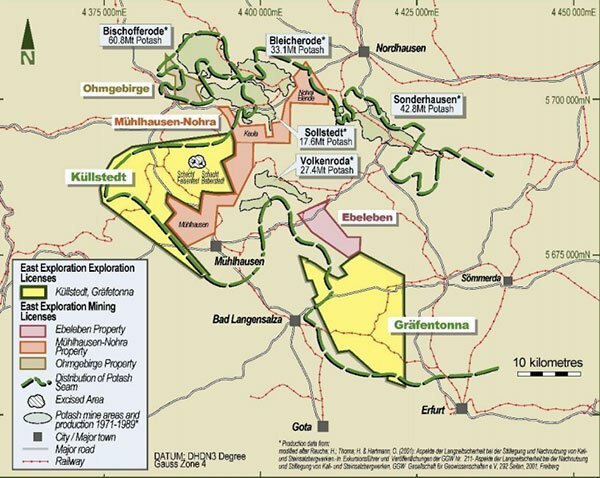 Meanwhile, the Mühlhausen, Keula and Nohra-Elende historic Resource of 1.11 billion tonnes containing 114.9 Mt K2O of mixed potash salt is in an area that adjoins DAV’s Küllstedt licence. Mixed salt comprises both potassium chloride and potassium sulphate amenable for both muriate of potash (MOP) and sulphate of potash (SOP) production. As we’ve said, JORC conversion of these Resources is an ongoing process, but DAV is making good progress. 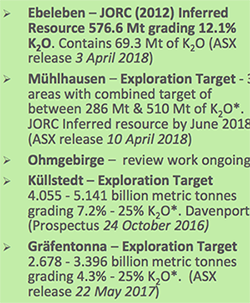 The company is expecting to have an Inferred JORC Resource for its Mühlhausen exploration target by June — only weeks from now. 95% of the world's potash is used on farms to fertilize the food supply. It's an essential ingredient that helps to improve crop yields, heighten resistance to plant diseases, and increase water retention. Potash is therefore essential in combating the challenge of the world’s swelling population, which is growing by 80 million each year and is headed to 9.3 billion by 2050. A consequence is that arable land per person is rapidly shrinking, making fertilizer vital to increase global farm output. 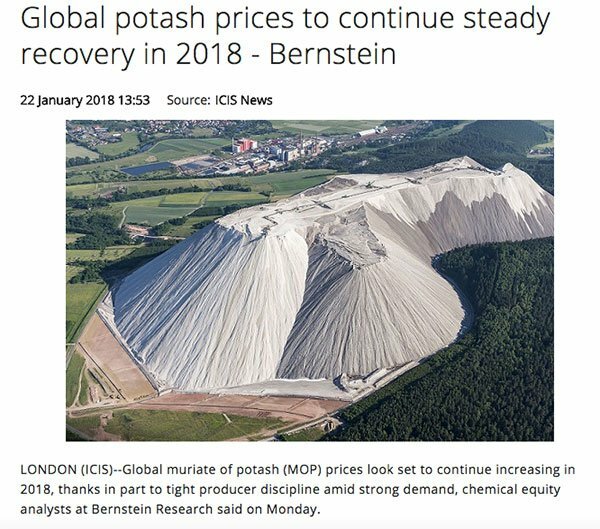 With that in mind, global Muriate of potash (MOP) prices performed strongly last year, increasing at a slow, steady pace. Each major consuming region reported big gains with Asia accounting for more than 60% of the price surge. Continuing into 2018, the potash market is emerging from a period of oversupply, with demand growing by around 3% per year and is expected to reach a record 61-64 million tonnes this year. As inventories dwindle, the MOP price, which is now around US$220 per tonne, is also beginning to recover. Alongside this, increasing demand in India, China and Europe is rising, with India set to import some 4.5 million tonnes of MOP. On top of that, producers and buyers anticipate that availability will tighten, placing further upward pressure on prices. These kinds of dynamics make DAV’s central focus on building its potash base an astute one — and it’s doing that in a globally recognised region that’s been producing ample amounts of the stuff since the 1890s. It should be noted, however, that commodity prices do fluctuate and should not form the basis of your investment decision alone. Seek professional financial advice for further information if considering this stock for your portfolio. Currently capped at $2.8 million, and bearing in mind the considerable size and high grades of DAV’s JORC-compliant and historical Resources, this tiny potash stock makes for a strategic entry point into a steadily moving market. Working distinctly in DAV’s favour is the exceptional starting point it has to fast-track evaluation of its Resources with the aim of continuing potash production in the South Harz region, which is still productive after 120 years. As you can see, DAV is looking to move fast and has a lot of work cut out for itself in the months to come. All in all, DAV is making steady strides in reinvigorating the South Harz potash basin and establishing its own vantage position in the district.